The Tab S2 is a premium tablet from Samsung that was released in Q3 of 2105 with two different variants, namely- 8.0 LTE and 9.7 WiFi. 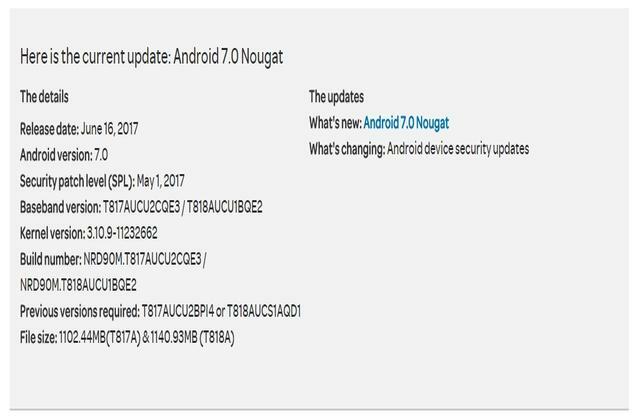 The European variants of Tab S2 (SM-T715) and (SM-T810) have already made their way to the Nougat in April 2017. Lately, we have also seen T-Mobile and Verizon updating the firmware for Galaxy Tab S2 with Android Nougat. Following the same, the US carrier AT&T is now rolling out Android 7.0 for the Galaxy Tab S2 with the latest May 1, 2017, security patch from the AOSP. The update comes as an OTA(Over-The-Air) update, installing the same will take your device to the Android 7.0 Nougat. Moreover, upgrading the firmware will take the SM-T817A to its PDA T817AUCU2CQE3 respectively. Similarly, the SM-T818A will be updated to its PDA T818AUCU1BQE2 in particular. The screenshot shows Android Nougat is being pushed to the AT&T Galaxy Tab S2 variants. The OTA weighs around 1.1GB and it can only be downloaded if you are running the stock Marshmallow firmware versions T817AUCU2BPI4 or T818AUCS1AQD1 in particular. If you haven’t received the OTA yet, follow the steps given in this tutorial below. The Developer Preview 3 for Android 8.0 is already out, this also hints that Samsung will soon update its remaining devices to Android 7.1.1. This also makes it certain that the users will soon be able to get themselves register in the Android 8.0 beta program once it is out officially. How to Capture OTA for AT&T Samsung Galaxy Tab S2 with May 1, 2017, Security Patch? To capture the OTA few things are very essential, follow the steps as given to capture the OTA successfully. If you need more help, you may visit the official AT&T support page. Meanwhile, the full firmware Odin flashable files are not available, we will update the article with updated links once the full firmware files are available. So, stay tuned on that. Total click bait, waste of your time. Where is the OTA? Where is the download?